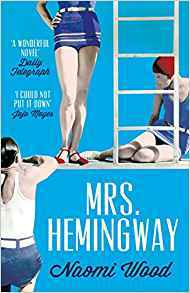 Mrs Hemingway is the gloriously heartbreaking novel from Naomi Wood, originally published in 2014, about the lives of the four wives of Ernest Hemingway. Such incredible women, such amazing stories. If, like me, this is an era that evokes images of a 1920s sun-washed Antibes coastline and a hot and humid Cuba, then I recommend you pick up a copy. Mrs Hemingway is a novel that I absolutely devoured as I was transported back to a time that has always held great fascination for me. Naomi Wood has brought the lives of the four Mrs. Hemingways together in this imagined account of the complex life of a very complicated and troubled man, Ernest Hemingway. Having read a variety of books from this era, I am always attracted to the lives of The Lost Generation. There is always something so very fragile about them. The decadence of their party lifestyle was always against a backdrop of a deep sadness and, what appeared to be, a general unhappiness. Naomi Wood has taken factual information and built this incredible story around these four very different women who all had one thing in common, their love for a great man, a man who was never truly available for them to love. Mrs Hemingway spans the years between 1926 and 1961 as we get an insight into the lives of Hadley Richardson, Pauline Pfeiffer, Martha Gellhorn and Mary Welsh. It’s a very heartbreaking tale in many ways as we witness the demise of a man who was so loved by many but was always hungry for more. Ernest Hemingway’s life will continue to fascinate. There is something enigmatic about his personality that, even now so many years later, draws people in. I loved Mrs Hemingway, as I knew I would, and it inspired me immediately to purchase For Whom the Bell Tolls, the novel Ernest Hemingway dedicated to Martha Gellhorn. My fascination with The Lost Generation continues….